It was full of fond memories, the 50th anniversary special. How could it not be? It featured every single one of the Doctors who have appeared on the show since it first premiered half a century ago, plus John Hurt’s new War Doctor, Tom Baker’s mysterious future Curator Doctor and even the angry eyes of Peter Capaldi’s Twelfth Doctor. That’s fourteen Doctors total. They gave us plenty of happy times to think about. But after watching the special, the one memory I find myself revisiting more than any other is a chilling one from the very first Doctor Who serial in 1963. In that story, the Doctor and his companions travel back to the Stone Age. At one point, they’re being chased through the woods by a caveman who gets attacked by a wild animal. While the Doctor’s companions go out of their way to help the caveman and tend to his wounds, the First Doctor picks up a rock. He’s going to bash in the caveman’s skull. It’s the very first Doctor Who story ever and he’s ready to commit cold-blooded murder. It’s one of his companions, Ian Chesterton, who stops him — the same Ian Chesterton whose name we see in the very first shot of the anniversary special: listed as the Chairman of the Governors at the school where he once taught, and where Clara is now teaching. That theme has been repeated many times over the years: the Doctor’s dark side is kept at bay only through human contact. We saw it, for instance, at the end of David Tennant’s run. Travelling alone, without a companion, he spirals out of control. In “The Waters of Mars,” he decides he should be the lone ruler of time, and tries to undo the fixed history of what happened to the first colonists on Mars. It’s a bad decision. More recently, that theme has been coming up over and over again in the final season of Matt Smith’s run. As Amy and Rory spent more and more time at home, the Doctor got darker and darker. In “Dinosaurs on a Spaceship,” he lets the dinosaur trader get blown to pieces. In “A Town Called Mercy,” he’s willing to sacrifice the alien doctor to the cyborg until Amy talks him out of it. In “The Cold War,” he’s willing to blow up the submarine — it’s Clara who talks the Ice Warrior out of causing a nuclear holocaust. Meanwhile, during the entire second half of the season, the Doctor is keeping plenty of dark secrets from Clara. And in the 50th anniversary special, we see the Doctor in what must be his darkest moment of all. He was going to do it again. After seven seasons and hundreds of years spent mourning the genocide of the Time Lords and the Daleks, the Doctor was going to going to press the big red button all over again — to make the same decision once more. In fact, not just once, but three times. Three different Doctors at three different points in his timeline were all prepared to commit double-genocide. 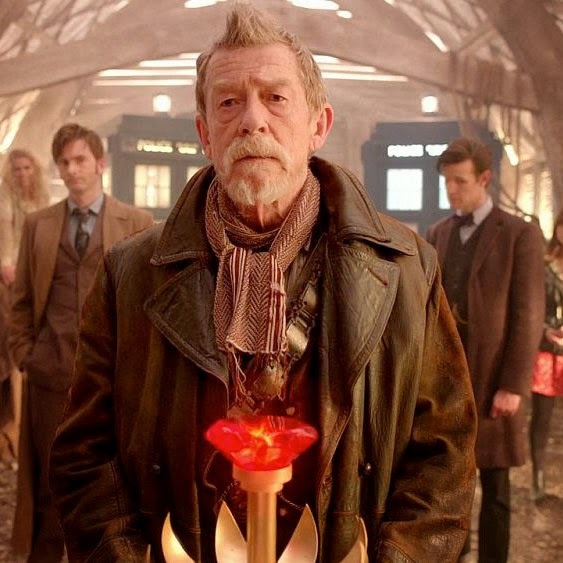 John Hurt’s War Doctor, the darkest Doctor of them all, has no human companion. It seems likely, in fact, that he never has. We saw in the mini-episode, “The Night of the Doctor,” that Hurt’s incarnation was born during the Time War, a time when humans wouldn’t dare to become his companion. When the Eighth Doctor, Paul McGann, tries to save a human from a crashing spaceship, she rejects him. She would rather die than travel with a Time Lord. One suspects the dark acts Hurt’s Doctor committed during the Time War were all done without a human by his side. Meanwhile, the Tenth Doctor we see during the anniversary special is David Tennant’s Doctor at his very darkest point. We know from the way his marriage to Queen Elizabeth I slots into his timeline that he meets John Hurt and Matt Smith right between his breakdown in “The Waters of Mars” and his death in “The End of Time.” He has no companion right now, either. And things are very dark for him. Then there’s Matt Smith’s Eleventh. He’s been having those dark moments all season long and he still hasn’t recovered from the loss of Amy and Rory. In fact, he’s wearing Amy’s reading glasses the very first time we see him in this episode. He’s never quite made the same emotional connection with Clara — he spent too much time seeing her as little more than a mystery to be solved — but he’s still the only incarnation of the Doctor with his hand on the big red button who also has a companion at that moment. And so maybe it’s not surprising that it’s Clara, more than anyone else, who saves the day. “Waste no more time arguing about what a good man should be. Be one.” Marcus Aurelius wrote those words in his private notes to himself nearly two thousand years ago. He was the Emperor of Rome at the time, but also a philosopher struggling to be a moral person in the midst of a European war. His words are the very first to be uttered in the anniversary special, as Clara teaches them to her class at Ian Chesterton’s old school. By the end of the episode, she’ll be urging the Doctor to follow Marcus Aurelius’ advice. And the Doctor does. He listens to Clara. And to the Moment — whose consciousness, it seems, may very well exist thanks to another human companion: Rose in her Bad Wolf days — when the Moment suggests the first spark of the idea of using the sonic screwdriver to escape the jail cell. It takes that bit of clever thinking and the combined effort of all fourteen incarnations, but the Doctor does finally stop thinking about what he did during the Time War and takes action to fix it instead. He is a Time Lord, after all. Not Hamlet. In many ways, it seems a bit worrying, this re-writing of the show’s history. The Doctor’s crimes during the Time War have played an important role in the show since the reboot began and there are supposed to be some things he just can’t change. 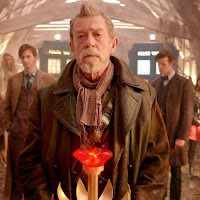 Plus, as John Hurt’s Doctor points out: his regret over the Time War has driven him to save many other lives. But while he might have found a way to save the Time Lords, there is still plenty of blood on the Doctor’s hands. Not only was he about to commit genocide against the Time Lords again, but he also commits genocide against the Daleks. As terrible as the Daleks are, that crime isn’t something the Doctor takes lightly. In fact, the question of the genocide of the Daleks is one the Doctor has been debating since as far back as Tom Baker’s run as the Fourth Doctor in the 1970s: he had the opportunity, argued about it with Sarah Jane, and was interrupted before he made his decision. More recently, it was the main storyline at the end of Season Four, when Donna and two versions of the Tenth Doctor (the original and a copy generated from his severed hand) faced off against Dalek Caan. Dalek Caan had been driven mad; in part, by witnessing the terrible atrocities committed by his own kind during the Time War, and he was now determined to destroy all Daleks. “No more!” he declared in the season finale — using the exact same catchphrase the War Doctor uses in the anniversary special. Dalek Caan manipulated events to ensure that the copy of the Tenth Doctor would commit a second genocide against the Daleks. It was a crime so terrible that the original Doctor banished the copy to a parallel universe where Rose could be his lifelong companion. That way, the copy could learn from her humanity and keep his dark side at bay. But the original Doctor has still committed that very same crime: the genocide of the Daleks. And in the anniversary special, the three Doctors unite to do it again. So while Matt Smith’s Eleventh might be pleased with himself at the end of the episode — proud that he seems to have found a way to save his people — I can’t help but think of all the people he didn’t save. And of how willing all three Doctors were to press the big red button before Clara finally talked him out of it. The Doctor is still a war criminal. He still has blood on his hands. Fifty years after the First Doctor was going to murder that caveman, there’s still plenty of darkness left in his hearts. - "If I grow to be half the man that you are, Clara Oswald, I shall be happy indeed." Hurt's Doctor, I think, understands that Clara was the real hero. - I was under the impression that the season finale left us with a cliffhanger: the Doctor and Clara stuck inside his timeline. How did they get out? That was supposed to be a big dangerous thing — him entering his own timeline — but... apparently not so much? - Since the Hurt Doctor can't remember all of this, he just assumed he pressed the button? - I'm unclear on just how much the Doctor does or doesn't remember about all these events. The Eleventh in the gallery: "I remember this." Sideways glance. "Almost remember." And then he knows he needs to send his fez through the portal. "Of course," he says, "this is where I come in." It seems like an important detail. - Is undoing the genocide something of an indictment of the bombing of Japan? I've always thought Doctor Who is a way of telling stories of the lessons we learned in the wake of the Second World War — and that the genocide in the Time War was something of a metaphor for the Allied use of the bomb. Do you think Harry Truman ever counted the number of children in Hiroshima and Nagasaki? - I was a bit disappointed by the visuals of the Time War. It didn't look like all of time burning at every moment, but more like a pretty traditional, Star Wars-esque battle. - In Steven Moffat's old sitcom, Coupling, there's a joke about the "John Hurt moment" from Alien. In this episode of Doctor Who, we get John Hurt and The Moment. - This episode really didn't seem to have much to do with the over-arching storyline of the Eleventh, or this season, except for the brief mention of Trenzalore at the end. - This does explain why all the Daleks didn't completely disappear when the Doctor used the Moment — because he didn't! - There seem to be many different meanings contained in that line "No more." The desire to end the Time War. The desire to undo what he did in the Time War. Maybe the end of the regret? And so, the end of being the kind of Doctor who lets the Time War overshadow him? Maybe the end of the young Tennant/Smith style of Doctor? - One of my favourite details is when the Tenth & Eleventh try to "reverse the polarity." That's a line the actor who played the Third Doctor, John Pertwee, liked to say. - Metpahor: they're LITERALLY all in prison together, trying to find a way out, and Clara comes and saves them. - In a recent interview, Moffat seems to suggest the regeneration limit is, indeed, a thing: "Paul McGann turns into John Hurt so they're not the same incarnation. He used up another regeneration and I expect he'll be in trouble shortly - you can't break rules laid down in the Deadly Assassin." Read previous recaps of Doctor Who episodes, beginning with the season finale here.